75 Ton Hoist Improves Yard Capacity. 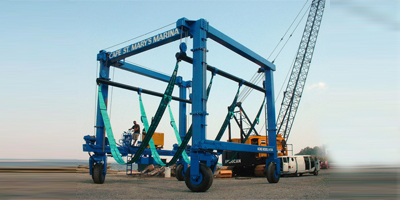 Sigma Design was approached by Acme Hoist to help them extend their product line of large boat hoists. Acme Hoist is a family run business and had been manufacturing boat hoists on Long Island for over 50 years. Improving the steering profiles to allow tight radius cornering and other operator/user features provided better handling in the tight space of a busy boat yard. Creating a new 50 Ton and 75 Ton hoist enabled Acme to better compete with the larger global competitors. Concept Layouts, Structural Load Analysis and Simulation, Detail System Design, Welding Fabrication and Manufacturing Shop Drawings.